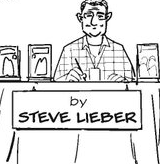 * artist Steve Lieber's very funny portfolio critique is now a buyable print. * totally missed that Steve Benson was let go by the Arizona Republic and agree with Pat Bagley that this is a stupid, short-sighted decision. I think that any of the remaining working staff cartoonists are good enough that it's up to the newspaper to figure out how to employ them in way that sells copies and/or drives hits. In general the recent round of journalism cuts has a real end-of-industry feel to it, more than anything since the original deep cuts made back in 2008-2010. * otbp/not comics: our pal from two entries above this one Steve Lieber found a prose book illustrated by the great Jaime Hernandez. * by request extra: cartoonist Patrick Dean's family is participating in a comprehensive support program run by a family friend. You probably don't live close enough to be a meal-maker or a shopper or a check in person, but those meal cards and the occasional thing popping up on their Amazon wish list would be greatly appreciated. * not comics: here's a profile of 1990s TCJ mainstay Christopher Brayshaw in his current gig. * finally: that's quite the illustration by Jillian Tamaki.